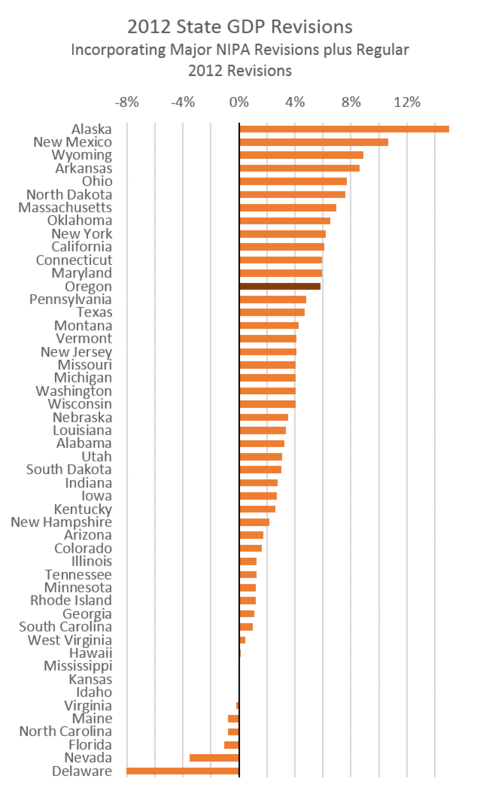 One more on State GDP. As stated in the previous post, the BEA underwent a comprehensive revision that added various categories including R&D and Intellectual Property Products to the total. Overall this raised the U.S. GDP by about 3 percent, while the growth rates remained largely the same. This impact was not even across states in terms of raising the level of state GDP. Below are the comparisons of 2012 nominal GDP to the just released revised versions of 2012. It is important to keep in mind that these revisions include the new categories but also the typical, annual revisions that incorporate more data.